If I had to pick the most iconic episodes of Season 1, or rather, the episodes I feel like are the most well-known of the season, I’d probably have to give my vote to the Christmas episode and the episode we will be looking at today; The Telltale Head. In this episode, we will live (or relive) through one of Bart’s most notorious pranks in the show’s history. How will it all go down? Let’s find out! 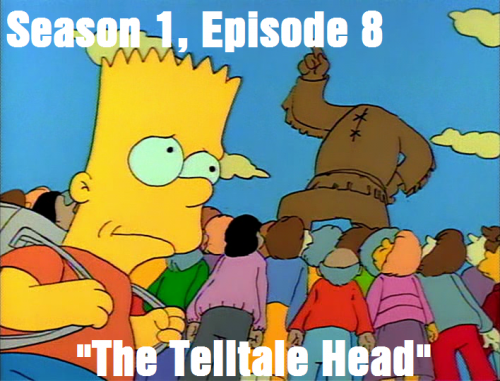 The Telltale Head aired on February 25th, 1990 and was the seventh episode written for the show, and the eighth one to air in the Simpsons first season. It’s kind of odd when you look at that fact, considering this episode was written before the previous episode, but it aired afterwards. I guess something must have held up this episode up or something. The chalkboard gag for this episode is, “I did not see Elvis,” and the couch gag is actually a repeat of the couch gag that showed in “Bart the Genius,” where Bart is sent flying into the air, coming down in front of the television screen while it’s showing the producer credits. This episode actually starts with what will ultimately be the conclusion of this story. Bart and Homer are walking down a sidewalk at night while Homer is trying to console Bart. Apparently Bart has done something very bad and it’s very apparent that they have the head of a stone statue in their possession. Before Homer gets very far with his talk, a mob shows up and starts to chase them through town. They ultimately get surrounded, but before the mob can rip them apart, Bart decides to explain why they have the head of the town’s founder, Jebediah Springfield, and starts telling his story of the events that led to this moment. The story starts with The Simpson family attending church on a Sunday morning. The kids attend Sunday school and the adults listen to a sermon given by Reverend Lovejoy. Although the church scene doesn’t really have much to do with the rest of the episode, it’s good for a few laughs as the kids continually stress out the Sunday school instructor with way too many questions that she doesn’t know the answer to. And then Homer, who is listening to the football game broadcast on a radio, starts celebrating when his team makes a last-second push to win the game, not realizing that his shouts of jubilation are heard through the entire church and interrupt the reverend’s prayer; which incredibly humiliates Marge. On the way home, Bart sees that the new Space Mutants movie is playing at the movie theater and he asks to see it, but Marge refuses, saying the movie is too violent. Bart gets the money to see the movie anyway from Homer after lying to him and so he skateboards to the theater. When he arrives, he runs into Jimbo Jones and his friends Dolph and Kearney; three older kids who are known for having a bad reputation at school for being troublemakers. They ask Bart if he wants to sneak into the movie without paying and Bart reluctantly accepts. The four kids eventually get thrown out of the movies and then they proceed to go around town causing mischief. They steal goods from the convenience store and then they start throwing rocks at a statue of the town founder; Jebediah Springfield. Bart knows that what the kids are doing is wrong, but he goes along with it anyway because they start to accept Bart and think he is cool for hanging with them. They then lay down in the middle of a field and start looking at the clouds, remarking how certain clouds look like different things. Bart notices a cloud that looks like the Jebediah Springfrield statue, but without the head, and when he tells the others about it, they start remarking that it would be cool if someone did cut the head off of the statue. Bart has enough and tells Jimbo and his friends to stop, but then they start making fun of Bart for defending the town founder, and telling him to leave in the process. Bart decides that he wants to cut the head off the statue, but before he does, he asks his father how important it is to be popular. Homer, completely unaware of the reason Bart is asking the question for, tells Bart that being popular is the most important thing in the world and that he should do anything (shy of killing someone) to be popular. 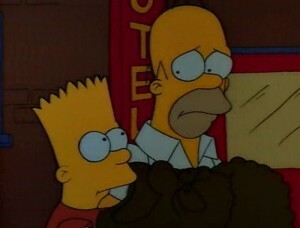 Because of this, Bart goes out during the night to cut off the statue’s head. However, once the deed has been done, Bart starts to realize that there is no going back and thinks that he may have made a mistake. The next day, the entire town is in an outrage about the missing statue’s head, including the Simpson family, but they are completely unaware that Bart is vandal. Bart hides and takes the head to show to Jimbo and the other guys, but before he can show it, the bullies remark that if they find out who cut off the head, that they would beat the person up. 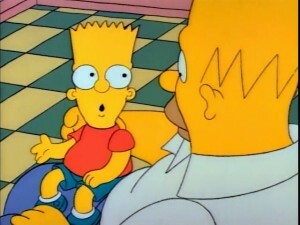 When Bart brings up the discussion from the other day, they claim that it was only “cloud-talk” and that they would never actually disrespect the statue of the person who founded the town and killed a bear with their bare hands. Bart continues to feel the guilt throughout the rest of the episode and at his lowest point, he decides to finally come clean. He shows the head to his family and explains that the only reason why he did it was because he got the impression that being popular was the most important thing in the world. Homer realizes that he gave Bart that thought and decides that both he and Bart must come clean to the authorities. The scene from the beginning of the episode continues and Bart apologizes for doing what he did and is willing to take responsibility for his actions. The entire town decides that Bart has suffered enough and that he truly feels badly for what he has done, so they accept his apology on the condition that he puts the head back on. Bart heroically takes the head and puts it back on the statue, absolving him of any guilt and bad feelings he had prior. The entire town celebrates the restoration of the town founder’s statue while Homer and Bart leave; Homer remarking that Bart did a good job, but that lynch mobs are never usually this nice and Bart should consider himself lucky. If there was ever an episode this season that I watched before the DVD boxset came out (at least that I know of), this would probably be the only episode that would meet that criteria. This is an episode I will always remember and never forget, just because of how familiar it is in the Simpsons mainstream. I’m not sure if I would call it one of my favorites because of that, but I do know that many people I’ve talked to about The Simpsons have seen it, or at the very least, know of its plot of how Bart decapitated the head of the town founder’s statue. I guess you could say it’s a “classic” episode. I have to say, this episode doesn’t really have a whole lot of jokes involved with it. Sure, there are some funny moments in the opening act with Homer acting up in church and the children in Sunday school incessantly asking the most out-there questions for the instructor, but this is definitely a plot that is driven by emotion more than humor for sure; especially in the second and third acts. 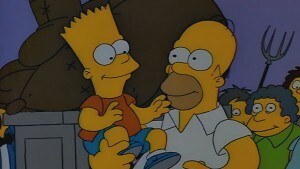 If I had to pick my favorite joke, it would probably be the very last line in the episode where Homer tells Bart, “Good going son! But remember; most lynch mobs are not this nice!” Not only is it poking fun at how easily the conflict wrapped up, but it’s also a very nice warning to Bart as well, as Homer seems pretty confident that something like this could happen again, so Bart should watch what he does from now on. This story is a very clear parody (especially when you consider the name of the episode) of “The Telltale Heart” by Edgar Allan Poe. 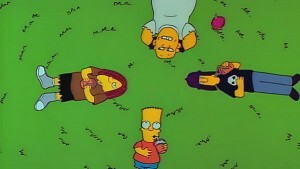 Much like the character in the poem, Bart is living with the guilt of something bad he did, and he is constantly reminded of that guilt in the disappointment of all the townspeople and by the sound of the statue’s head talking to him; continuing to eat away at his conscious the longer and longer the prank goes on. Although The Simpsons will be known for making references and parodies throughout the entire span of the show’s history, I feel like this is the first big one, or at least the first one I recognize that focuses on an entire episode as opposed to a small scene. In fact, the episode also makes a reference (one of many over the show’s history) to The Godfather when Bart wakes up and finds the head of the statue in bed with him (a nod to “finding a horse head in your bed”). I’m sure I will definitely miss out on references as we move forward, so if there ever is a reference I don’t call attention to, and you feel like it’s noteworthy, feel free to do so by leaving a comment on this and all future posts. I don’t claim for this series to be an extensive encyclopedia to all things Simpsons; this is more so just my take and analyses of the episodes, so please keep that in mind. Much like “Bart the Genius,” this is a very a “lesson-learned” storyline, where we follow supposed bad-boy Bart Simpson, watch as he does something bad, and then starts to regret what he has done and seeing how the guilt affects him and how he decides to make amends for his actions. Unlike Bart the Genius though, I feel like this episode does a much better job of showing that Bart has learned his lesson; mainly because we didn’t really see the ramifications for Bart’s actions in the prior episode. In this episode, Bart is almost lynched by an angry mob, and the guilt he had for his prank was hitting him really hard as well. In fact, as soon as Bart cut off the head, he remarked, “What have I done?” so you can see Bart was already trying to fight against what he knew was wrong, which I do like to see in Bart’s character development. He’s not a bad kid by any means, he’s just impressionable and is trying to find his way, and sometimes during that journey, you will make mistakes. The key is learning from those mistakes. So on the whole, I do think this is a very good episode and I can see why it is hailed as a classic Season 1 episode by many Simpsons’ fans. However, it’s hard for me to say that I like this episode better than other Season 1 episodes like Bart the General and another episode we will be seeing in a few weeks. I think it’s just because I’ve seen this episode so many times and have been familiar with the basic storyline for it, that maybe it has just lost its novelty for me. It would still probably rank as Top 5 for the season most certainly…just not in my highest tier. But yeah, that will do it for The Telltale Head, so thanks to everyone for reading, I’ll see you all next time, and remember…if someone talks about cutting off the head of your town founder’s statue, make sure it’s not just ‘cloud-talk’ before turning them into the authorities. All right, we are done with yet another episode, but before we move on to the next one, I would like to take this opportunity to remind you guys that I will be on vacation, so there will not be any posts of this series next week, and probably the following week either (and if it is the following week, it will be later in the week once I’m on schedule again). I’m honestly amazed I have made it to this point already, as I honestly figured I would be further behind, but I have to say that this series has struck a chord with me and I can see this continuing on for a really long time. We only have 5 episodes of the first season remaining and I’m itching to see how they will go. However, first thing is first…I need my annual vacation relaxation before I do anything else. Catch you guys later!